Welcome Friends & Visitors, My name is Merlin and it has been a phenomenal experience living, schooling, working, and playing here in Hawaii. 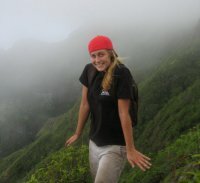 I have built and dedicated this site for all those interested in enjoying the Hawaiian environment and activites. It is particularly geared towards BYUH students. As of now I have been relocated to the Las Vegas area for a time. Please spread the word and URL (www.merman.us) to any and all students that might need and benefit from the compiled information contained here. On a personnal note, I think it's a crime for any BYUH student to feel bored or "stuck" in Laie. Click Photos for photos by Activity, Date, or Individual. The Activities page has Maps, Directions Etc. for each activity. The Blog link has personnal stories and experiences with a particular activity. It's official, my wife and I have purchased flights for our return to Hawaii this summer. Our family will be on Oahu for a week and a half starting August 1st. Also, after being broken for a few years, I finally got the guestbook working again here. Drop in and leave some comments. Cheehoo! My parents have received a mission call to BYUH and have arrived on Oahu. They have an office in the library and are working in the academics department. 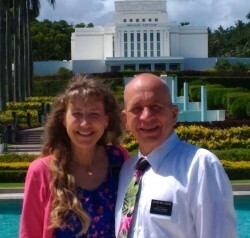 Say Aloha to Elder & Sister (Ivan & Lory) Wollenzien. Jonathan Crocket who lives & works here in Laie has been added as an admin to the www.merman.us site Check back frequently for more awesome activities and information. 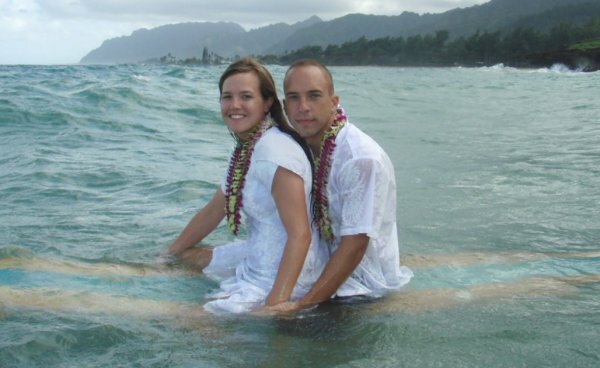 Aloha, we both went through with the wedding. Woohoo! Living in Logandale, Nevada right now and working for the power company. We're Pretty stoked to have a good paying job and low bills. We miss the cool ocean and the beautiful ko'olau mountain range and all the carefree, adventerous, students of BYUH. Enjoy your time there while you can everyone and hopefully we'll come visit before to long. Emily and I are Engaged! Well the last few weeks of surf have been glorious. Went to Leftovers and Turtle Bay a few times during the week. Then we went to pinballs at Waimea Bay on Saturday. I was surprised that there wasn't anyone else out at the Waimea break on Saturday - Emily, Randy, Billy and I had it all to ourselves. It was wonderful surfing there as usual. I took the camera out a couple times and switched off with Randy taking photos. Click the images below to see the surf photos. 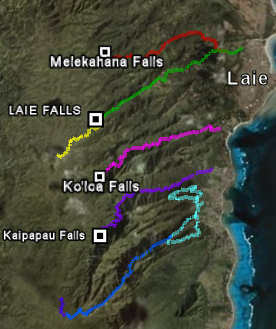 A few weeks ago a small group and I hiked into Kahana Valley on the Nakoa Trail (marked in blue in image at left). We noticed two other routes off the main loop and determined to return to explore more which we did today. This time we took a route that started near the large cement boxes that are randomly sitting in the valley there (where the green trail meets the blue). 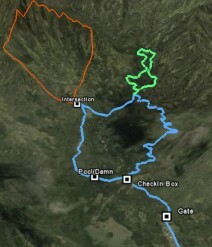 The second route (in green) was quite an amazing trail. It started off going through a bamboo forest then it followed the stream cut in the ridge about 80-100 feet above the water. Since it was higher up it offered a great view of the stream and trees and all. It looped around down into the stream and returned through the river bed. No back-tracking on either trail. I have not yet hiked the one in orange . I marked the intersection where the trail starts and then drew the trail in orange of what I estimated it to be from a hiking book description. I aim to follow and mark it with my GPS like the other two. The one in orange goes up a ridge near 1,000 feet elevation and should offer a pretty good view of the valley. The other two loops don't get higher than 380 feet elevation. Great trails all together, it's a shame I didn't explore them sooner. Aloha, I've been back on the island for a couple weeks now. Dave King, Billy, and I hiked the Crouchling Lion ridge last week. Started late - around 5:30pm and ended up doing half of it in the dark. I brought my head lamp of course which saved us from falling to certain doom. Took a bit longer though as the three of us had to share the light. No need for rush though. The weather was nice and I think we enjoyed the hike for the most part. 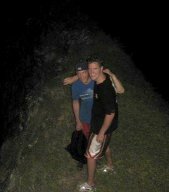 It was Billy's first hike in Hawaii - so congrats to Bill on one of the toughest hikes he'll probably do here. North Shore swell has started picking up. Surfed pinballs at Waimea yesterday and much enjoyed the break. Stoked for larger, frequent swells coming up. Whats up all, I'm leaving the island today for about three weeks. Gona head to Utah to see family and take a week long white water rafting trip. I'll head to the beautiful silver state of Nevada after to visit more friends and family. Goodluck to all on your Hawaiian Adventures. We had a small swell this weekend on North Shore. Randy, Emily, and I hit up left overs on Friday afternoon which was breaking overhead occasionally. On Saturday morning we got up at 5:30 and went to Chuns break before the crowd came. The waves were smaller, but still fun to surf at chuns. A short rainfall blew over us and then we got a rainbow out of it. Randy snapped a couple photos - below is Emily under the rainbow. (I edited a few other surfers out of the picture). I gathered a small party to hike the Crouching Lion Ridge this holiday. I brought Megan and a fellow named Sam that I just met. Emily and Sarah from Vegas joined me with Holli and her roommate Diana. The sky was mostly overcast when we got up and headed out, which was exactly what I was hoping for. Infact the weather couldn't have been more perfect. After reaching the highest point (2000 feet) the clouds rolled through the valley and up over the ridge top where we were hiking. It was quite a site to behold - like something out of a digital movie. Wish I could have captured the action in a photo, but these two are highlights. Just look how enchanted lil Holli is. So I got a call from Jared on Thursday afternoon while at the office. "Get up and leave work" were the first words I heard and I jumped up and walked straight for the time-clock to punch out. I knew the swell and surf were up a bit, but I wasn't sure where and how good the break was. 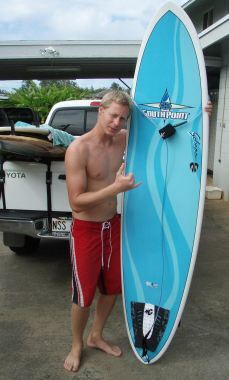 Jared had gone out to pinballs in Waimea Bay that morning and had an epic time surfing without a crowd. He, Randy and I headed back out that afternoon. Waimea is a generally a slow break and smaller than usual this time of year so I borrowed one of Jared's long boards and Randy borrowed his roommates. There's was only one other guy out there so we mostly had the waves to ourselves. Needless to say the waves were awesome and we had a thrilling day of surf. Jared snapped a couple photos of Randy (at right) and I (at left). At about sun-down we all three dropped down on a wave and rode it into shore. None of us had surfed at that location before and, even though it was a small wave break, it's definetely in my top 10 days of good surfing. Mahalo to Jared for the photos! 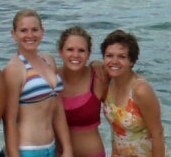 In other news, Emily, Adrianne , and Katie came to visit for the weekend (photo at left). They're friends that used to come to school out here. They, along with Tasha, Perla, Dallyn, and a few others, came with me to Electric Beach. We swam out to the pipes and dove into the warm current for fun. There was a huge school of fish - probably the biggest I've ever seen and we got some photos swimming around through it. Always good times on the West Side. We've spent a lot of time skin diving (snorkeling) lately, as we usually do this time of year. Went to Waimea Bay for some rock walking races and fun as well. 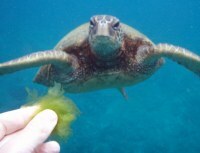 At Sharks Cove we gathered this light green moss (see photo at right) that the turtles eat. There' one in particular that loves it and will eat right from you hand. It's a 3-day weekend. If the rain holds off then Evan and a few others and I are going to Kiana Point on Saturday for some rock climbing. I'm thinking that Monday would be a good day for a trip to the West Side for snorkeling at Electric Beach. Pretty much everyone that can come should come. I'm going to make some calls on Sat & Sunday, please e-mail me if you want join or meet up with me. Surf report for today was ZERO on North Shore. It was a rather sad moment when I realized that the surf season for North Shore was pretty much over. I felt a little guilty as I walked into the surf closet, passed my board, and got my snorkeling gear out of storage. After making a few phone calls I picked up a few friends and headed up to North Shore. My mood improved a bit as we drove passed sunset beach and saw the ocean. It seems like it's been a long time since I've seen the placid truquoise-blue waters here. We pulled in at sharks cove, got suited up, and headed out. The visibility was optimal, temperature was warm, all the cares and worries of the world just washed away. The seven of us spent about an hour and a half taking photos and harassing sea life. Check Diving, North Shore for more photos. Well we started off our 3-day weekend with a new hike - Kaipapau Gulch which leads to Kaipapau Falls. The gulch is located between Ko'loa Gulch and the Ma'akua Gulch. It's the dark purple trail on the map at the left. I used my gps to record the tracks and stats. Total distance (one way) is 3.5 Miles with a max altitude of 930 feet. I updated the Photos page with a few pictures from the trip of the trail and waterfall. 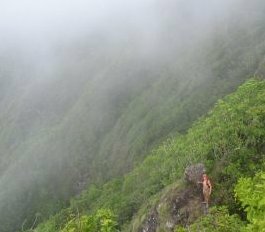 The Kaipapa'u trail and hike is similiar to it's neighboring gulch - Ko'loa. The trail starts off under the canopy and is fairly easy to hike for the first mile and half. You just got to make sure that you follow the pink trail markers. The second two thirds of the hike is mostly through the stream and rock-hopping (not much trail to follow, although the pink ribbons are still visible along the way). As usual with river-bed hiking, we all slipped quite a bit. Most of us came home with bumps and bruises and banged up shins. It probably wouldn't have been so bad if the weather had been dryer, but then the waterfall wouldn't have looked quite as pretty. Anyway, that's my word of warning. Keep anything non-waterproof sealed and protected. Check here for more details of this activity. Jared, Perla, Susan and I hiked one of the loop trails yesterday. It's been a while since I've done them and I forgot how enjoyable and beautiful the trails are. I told Jared that he probably wouldn't need his camera because there were no waterfalls or anything spectacular to photograph. He was pretty bummed when he got on the trail and saw how pretty it was. Sorry Jared, we'll go again soon. I used to come more frequently to jog the trails. I highly recommend it. The verticle ascends gradually about 500 feet so there's definetely a good cardio workout potential. The trails are maintained pretty well so you can jog around without hitting any branches. Took my GPS to record the trail distance and tracks. (I have both recorded now) I posted the results on the Hauula Loop Activities Page. It's been a great week for us regarding the surf life. Two of my roommates, Bracken and Jared, came out winter semester and started surfing with me. They've been using long boards and we've been going out to castles mostly (the bunny hill beach of surfing). I watched their progress for the month and a half and this week I decided it was time to try out some North Shore waves. It has been pretty small on North Shore this week (2-5 feet) and perfect for a step up of surfing. We went to one of my favorite surf spots - Leftovers, just past Waimea Bay. The waves were just perfect for us and it wasn't crowded at all. It was a little windy and choppy and sometimes long waits between sets - but it didn't bother us and it seemed to keep the crowd away. Needless to say it was a new experience for the boys - surfing some real waves instead of the Castles whitewash. Bracken had so much fun that we drove straight to Surf'N'Sea afterwards and he bought a bran new 7'6" epoxy fun board (photo at left). Jared did pretty well too and they've officially earned their surf diploma and are graduated from Castles surfing (though we may pay it a visit now and then). Aloha, I'm back from the mainland and also recovered from the Flu which I picked up on the plane trip back. I definetely need to get caught up on some good activities. I was hoping to get a new trail done this Saturday (a gulch behind Tamara's in Hauula) but there's supposed to be a lot of rain this weekend - kinda risky in the gulches. Perhaps a trail in Kahana Bay will suffice. I've had a lot of requests for information on the Stairway to Heaven hike so I've updaded the Stairway Activities Page with a few maps and directions of my prefered route (there are more than one) for reaching the staircase. As far as I know the trail is still closed, but ofcourse people still hike it (usually the early hours of the morning). Up | Down | Top | Bottom The information contained on this web site is not to be considered an official guide but is being made available so that you may have an idea of what we have encountered on these hikes and other activites. The author shall not be held liable for accidents, rescues, injuries or loss of life should you undertake any of the activities after visiting this web site. Hiking, swimming, diving, rock climbing and associated activities are dangerous and can result in injury and/or death. Risks are mitigated, but NOT eliminated by training or skill. It is your responsibility to determine whether you have the skills and experience demanded by a particular activity. Participating in the activities as described on this site is a personal choice and requires personal responsibility. If you end up dead or injured, it is solely your responsibility. If you are not willing to accept such responsibility then stay home.